Well now, authentic French cassoulet (a winter stew named for the pot it’s traditionally cooked in) is definitely not known for being veggie-friendly, so I decided to up the flavour on my vegan cassoulet with garlic confit (slow-cooked garlic in olive oil, yumm). 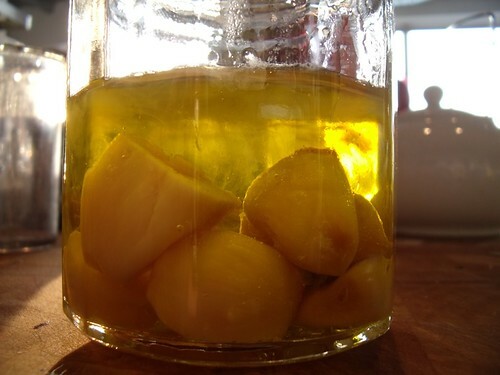 If you don’t have the time to make a garlic confit, not to worry, just pop in 4 whole cloves of raw garlic instead of the garlic confit. It won’t have as mellow a sweet-garlic flavour, but will still be lovely and garlicky! 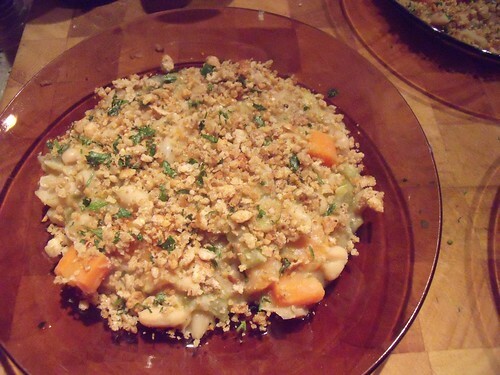 Apparently cassoulet is supposed to be 70% white beans, so that much is veggie-happy… but I must say that it was rather tricky to cook a vegetarian version of something I’ve never eaten before that is usually laden with multiple meats! Usually I have some kind of framework for dishes I’m recreating in the kitchen, but this was brand new, so it was total guesswork for me! Luckily this was a great recipe. 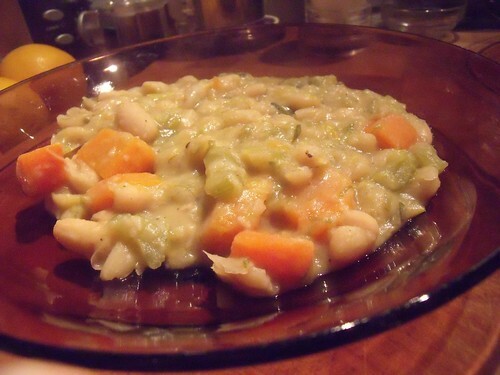 Beans, leeks, yum. And I have to say that this one tastes better the next day. Especially with the garlic breadcrumbs. 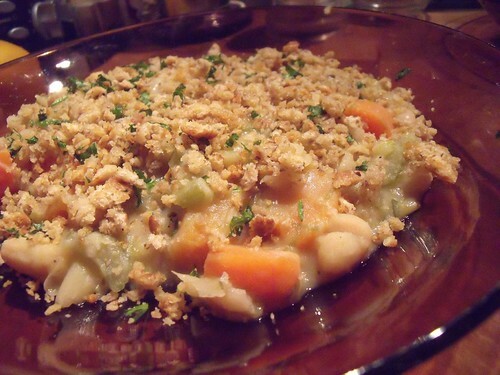 I served this to two omnivore guys this week, and they loved the cassoulet and raved about the garlic breadcrumbs! Success! 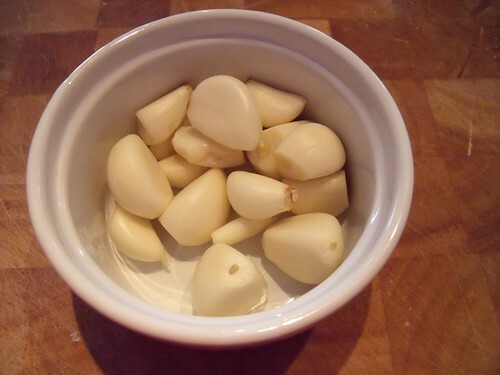 Place all ingredients in a ramekin, making sure all the garlic is submerged in the oil. Cover the ramekin with aluminum foil, and bake at 300F for 60 minutes, or until the garlic is golden brown and tender. Set aside to cool. 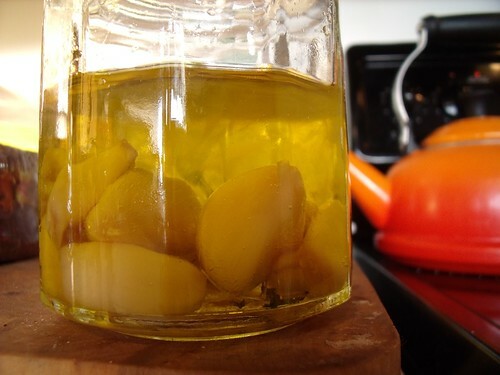 Transfer the garlic mixture to a glass jar, adding extra oil if you need to cover the garlic confit. Cover the jar and refrigerate for up to 2 weeks. 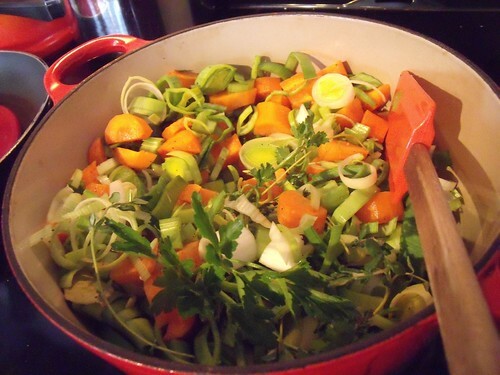 In a large pot, combine leeks, carrots, celery, garlic confit, oil, herb sprigs, bay leaf, cloves, and salt & pepper. Over medium heat, cook the veggies for about 15 minutes, until softened and golden. Add in the beans and water, and simmer for about 30 minutes, until the carrots are tender but not falling apart. To prepare the garlic breadcrumbs (while the beans are simmering): toss the bread crumbs with oil, garlic, and salt & pepper (to taste) in a bowl until everything is well-combined. Spread the crumbs over a baking pan lined with aluminum foil, and toast in the 350F oven for 12-15 minutes, or until they are crisp and golden. Let the crumbs cool in the pan, then return to the bowl and stir in parsley. Once the beans have simmered, discard the herb sprigs, bay leaf, and cloves. Mash some of the beans directly in the pot with a potato masher or back of a spoon to thicken up the broth a bit. Just before serving, sprinkle with garlic crumbs. 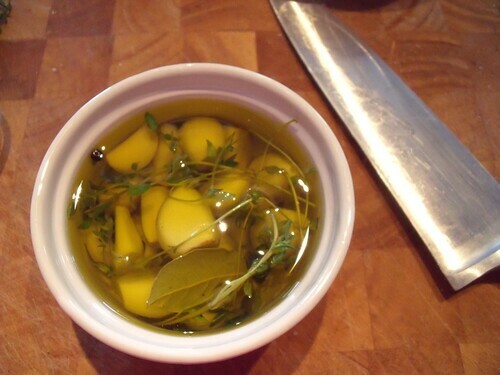 That garlic confit sounds amazing! Never had it, can’t wait to try. Got a feeling it might be in everything from now on!! You will LOVE it! It’s like roasted garlic but even yummier. And then you have garlic-infused oil too! That looks really amazing-all but the garlic in the jar… that looks like a science experiment. I made the confit garlic yesterday and it is amazing! I went ahead and cooked a cassoulet as well (because I had to use it straight away!) It was really delicious, thank you! I should be blogging about it later so I will definitely give you a link back. I made confit garlic bread too, you have to try it, its so good! Much to be Yummed about here. The Yummy Chickpea Channa/Roti is dinner tonight. Yum! You might want to limit the Yummying a tad; one Yum per recipe would be just Yummy enough to last until the next Yummy recipe! Yumm! And is Yum with only one m less Yummy than Yumm with two ms? The photos accompanying the Yummy recipes are beautifully shot. Yummmm! Sorry- just a point of form. The site and the recipes really are…….